What ChargeBee Triggers and Actions are Supported? Subscription Activated - Triggered when a subscription is changed from trial to active state. Subscription Cancelled - Triggered when a subscription is cancelled. Subscription Reactivated - Triggered when the subscription is moved from cancelled state to active or in_trial state. Update Subscription - Updates a Subscription in Chargebee. Update Customer - Updates a customer. Create Subscription - Create a New Subscription in ChargeBee. Record Offline Payment for an Invoice - Records an offline payment (Cash, Check, etc.) for 'payment_due' or 'not_paid' invoices. The invoice status will be marked as 'paid'. Add your ChargeBee account to Zapier to get connected with services available through Zapier. Click “Connect a ChargeBee Account”. Next provide an Account a name to easily recognize this account in Zapier. You'll need to provide your ChargeBee site name. This is also the subdomain where you login to ChargeBee. For example, if your domain name is https://acmeinc.chargebee.com, specify the site name as “acmeinc”. You'll also need to provide your site API key with "Full Access" permissions. You can get the API key under “Settings > API & WEBHOOKS > API Keys” inside of ChargeBee. Just copy the API key into the “API key” field in Zapier and click “Continue”. 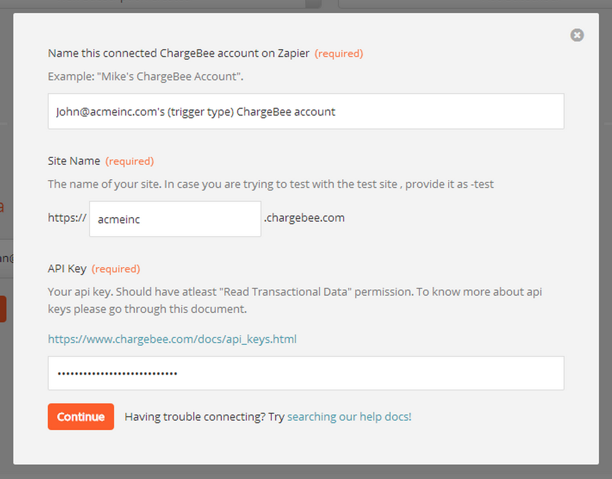 Zapier will finally verify your API key and if it is valid, your ChargeBee account will be connected to Zapier.